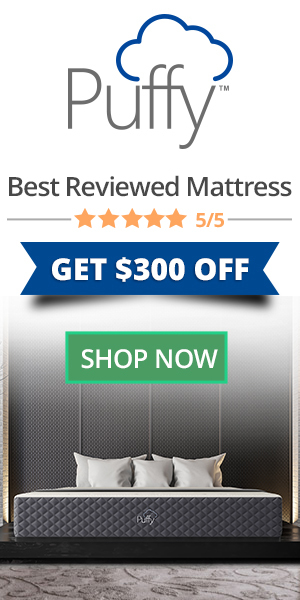 Sleep Guide > Recommended > Mattresses > What Is The Most Comfortable Mattress? Approximately 70 million people report some sort of sleeping disorder, defined by the Mayo Clinic as changes in the way one sleeps that affect one’s overall health, wellness and quality of life. Feeling comfortable while you sleep is the most effective way to fight any sleep disorder. Comfort is a simple thing, but for many of us, it is not as easy to achieve as it may seem. The average person spends thirty percent of their lives in bed. Over the average lifespan that accounts for roughly 230,000 hours laying on a mattress. That much time spent anywhere is bound to have a dramatic effect on your life whether you suffer from a sleep disorder or not, which is why it is important that you be sleeping on a mattress that provides you with as much comfort as humanly possible. If you are looking to ditch your old mattress in favor of a new, more comfortable mattress, congratulations, you have taken the first step in obtaining a good night’s rest. To find the most comfortable mattress for you, it’s important that you first understand the features that determine whether a mattress can be considered comfortable. Supported Spine- It’s no secret that back pain affects the quality of sleep. Studies show that mattresses that are reported as “uncomfortable” generally lack spine support, which is critical to alleviating back pain. Gravity pulls on the body during sleep. A mattress that does feature adequate spine support allows the hips, shoulders, and head to sink too far into the mattress which creates uneven pressure and discomfort along the entire spine. Edge Support- A mattress that lacks edge support is easily discernible from quality mattresses due to the sloping, uneven edge that has been worn down from regular use. Comfortable mattresses will always include a high level of edge support. Edge support ensures that the process of getting in and out of bed is easy and painless. Customization- No two sleepers are alike, which is why the importance of customization cannot be understated when searching for the most comfortable mattress. A mattress that provides the highest level of customization for you and your sleep partner will be the one that is best suited for your particular sleeping disorder and sleep posture. Budget- There are a lot of expensive mattresses on the market, but not every mattress is worth the price you will pay. The most comfortable mattress for you will be the one that is also the most comfortable on your wallet and one that delivers on its advertising promises. The benefits of sleeping on a comfortable mattress are evident in the number of medical issues and chronic sleep-related elements it prevents. Weakened immune system- Your body doesn’t just like sleep, it needs it. Though scientist are still unsure as to the exact physiological reason humans need to sleep, they are sure as to how much sleep the human body requires to function nominally, 6-8 hours according to a report by Sleep Medicine Reviews. Respiratory disease- A mattress that does not support the spine exerts uneven pressure on the diaphragm which can make it difficult to breathe properly while sleeping. Respiratory diseases can develop and be exacerbated by a low quality sleep from an uncomfortable mattress. Unhealthy body-weight- Those suffering from obesity, and those who struggle with body weight will only exacerbate their situations by sleeping on an uncomfortable mattress that was not designed to accommodate sleepers carrying extra weight. Those who do not suffer from a weight-related ailment may find that their lack of sleep has caused them to gain weight and exhibit the symptoms of an unhealthy body weight such as sleep apnea, increased blood pressure and irregular hormone production. All the more reason to seek out a comfortable mattress. Chronic pain- An uncomfortable mattress is considered uncomfortable because it does not support the area of the body that require it during the night. Uncomfortable mattresses and chronic pain move hand in hand. Reports also show that chronic pain and lack of sleep exacerbate each other. All the more reason to seek out a comfortable mattress as soon as possible. According to a report recorded in Sleep Medicine Reviews aggressively managing sleep disturbances is an important objective with benefits beyond the improvement in sleep. The number of sleep disturbances and the level of comfort you feel when you sleep is a direct result of your mattress and the way you sleep on it. Sleep Posture greatly affects quality of sleep. Determining the posture that you assume every night is one of the first steps to finding the most comfortable mattress for you. Regardless of the way in which you sleep (side, stomach or back) the mattress that you choose should enable a neutral, supported spine that eliminates uneven pressure on the hips, shoulders, neck, and head. Sleep Disorders & Comfort are directly related. Sleep apnea, restless leg syndrome, snoring, insomnia and a litany of other ailments have been attributed to poor sleep caused from sleeping on an uncomfortable mattress. The most comfortable mattress for you and your sleep partner will be the one that conforms the most to your individual sleep needs and preferences. We have already discussed the importance of enabling a supported, neutral spine while you sleep, but just as important are your individual preferences. If you or your sleep partner suffers from chronic back pain, then a firmer mattress may prove to be the most comfortable. Conversely, if you or your sleep partner have trouble falling asleep at night, an enveloping softer mattress may provide the extra comfort needed to fall asleep sooner and wake more rested. It is also vitally important to consider any sleep disorders that are exhibited by your or your sleep partner before buying a mattress. Neither of you will feel comfortable if you suffer from sleep apnea, chronic pain, insomnia, etc. if you don’t purchase a mattress that is designed to alleviate their symptoms. Don’t forget your sleep posture when choosing a comfortable mattress. The way in which you and your sleep partner sleep is going to play a large role in selecting the most comfortable mattresses you can. If you and your partner sleep in different postures, then an adjustable bed with individual sides may prove to be the most comfortable option for both of you. With all of the various mattress makers claiming to sell the most comfortable mattress on the market it can be hard to determine what type of mattress is going to provide the most comfort for you and your sleep partner. Mattresses generally come in one of eight different types with some hybrid mattress combinations. Designed for comfort. All mattresses are not created equal. The most comfortable mattresses will always be the ones specially designed to provide comfort over convenience. Every type of mattress is different and prioritizes a different aspect of comfort. To determine which will provide the most comfort for you it is important to consider which features align with your sleep preferences. Memory Foam- Manufactured from high-density foam which envelopes the body while remaining supportive of the neutral spine. Memory foam mattresses come in a variety of firmness levels, but don’t perform as well at regulating a cool sleep temperature. Gel- Gel mattresses are designed with various layers of gel inserts that excel at regulating a cool sleep temperature. Innerspring- Most standard mattresses are constructed with a variation of innersprings that provide a firmer sleep surface than gel or memory foam mattresses. Pillow Top– Pillow top mattresses are known for feeling exceptionally comfortable and providing a luxurious feel, similar to a plush luxury hotel bed. Latex- Latex mattresses include layers of springy latex that enable a “bouncy” feel and a firm sleep surface. Adjustable Bases- Mattresses that are designed to adjust are the most customizable option available on the market today; however, they also tend to be the most expensive. Designed for Convenience. Some mattresses types are great for nostalgia or convenience but tend to score low when considered for comfort and quality sleep. Waterbed- Waterbeds are designed to hold gallons of water and provide a soft, responsive feel, but tend to be expensive and cause more harm than good. Air Mattress- Air mattresses are simple and very convenient. They inflate in mere minutes; however, they simply lack the supportive inner construction of a mattress designed specifically to provide maximum comfort. To be considered the most comfortable mattress the bed must enable a supportive spine, alleviate uneven pressure, regulate temperature, and be affordable enough for a sleeper on a budget. Collected here are the best, most comfortable mattresses available on the market today. The Puffy mattress has received much attention since Ellen Degeneres gave one to every member of her audience live on television. However, the Puffy mattress hardly needs any airtime to convince the experts that it is one of the most comfortable mattresses that you can buy today. The Puffy mattress consists of two layers of memory foam that combine to provide ten inches of supportive, cooling comfort. The first layer includes Puffy’s patented Cooling Cloud Foam. Infused with cooling gel, the Cooling Cloud Foam layer is designed to address the most common complaint regarding memory foam, overheating, by providing cooling supportive comfort through the night. The second layer consists of six inches of Firm Core Support Foam designed to provide additional support and spinal alignment. When combined the two layers included in the Puffy mattress enable a cooling, comfortable and supportive sleep that alleviates pressure points and chronic pain. Mattress buyers looking for a quality, comfortable mattress might overlook the Nectar Sleep mattress for its low cost assuming that a quality mattress couldn’t possibly be so affordable. However, that would be a mistake as the Nectar Sleep mattress is one of the few memory foam mattresses to offer quality foam materials at an affordable price. The Nectar Sleep mattress is engineered to contour to the body without the feeling of sinking into the mattress. A feature the provides enveloping comfort while remaining supportive and alleviating uneven pressure on the spine. The Nectar Sleep mattress is constructed from gel memory foam that is quilted into the bottom of the mattress cover and within an intuitive support core consisting of high-density polyfoam. By avoiding the sinking feeling associated with most memory foam mattresses the Nectar Sleep mattress regulates temperature better than the competition. The Solay Mattress appears simple from the outside, but the secret to its incredible comfort are concealed inside a complex internal construction. The Solay mattress consists of six distinct layers that combine to provide the most comfortable sleep possible. The first and second layers consist of temperature regulating cover and cooling foam to keep sleepers cool all night long. The next three layers combine to form a hybrid, supportive base consisting of motion reducing foam, pocketed steel inner coils and pressure relieving support layer. The pocketed steel inner coils are engineered with Quantum® Edge technology which provides the Solay mattress with exceptional edge support. The pocketed steel inner coils sit on top of a layer of foundational foam which prevents the characteristic sink of most memory foam mattresses. Together these layers create an incredibly comfortable yet supportive sleep surface that is perfectly designed to alleviate chronic pain and enable a quality night’s rest. Choice makes all of the difference when selecting the most comfortable mattress for you and your partner, that is why the Muse mattress is offered in three different comfort levels to ensure maximum comfort for every sleeper. The Muse mattress is designed to be the last mattress you ever buy. The cover is made from polyurethane which helps to regulate temperature and remain cool throughout the night. It is also removable and machine washable, a feature that is seldom seen on other memory foam mattresses. The Muse mattress excels and providing pressure relief. The top layers consist of enveloping memory foam designed to reduce pressure in the hips, shoulders, and knees, ideal for side sleepers and those who are overweight. The bottom layers of the Muse mattress consist of eight inches of high-density polyfoam to form the supportive base and provide additional support for the neutral spine. Real Sleep claims to have manufactured their mattress using the cleanest process possible, and to the highest standards. After sleeping on the Real Sleep Mattress, the benefits of such a strict manufacturing process will become immediately apparent. Each Real Sleep mattress is made zero formaldehyde, phthalates, toxic flame retardants, or ozone depleters and includes an organic cotton cover. The Real Sleep Mattress consists of ten inches of medium-firm FloraFlex memory foam designed specifically to achieve the most comfortable sleep possible. The first comfort layer features an open cell design to regulate temperature and extract heat away from the body. The second layer is constructed from dense base foam that provides spine support and alleviates uneven pressure. The Real Sleep Mattress performs exceptionally well in terms of comfort. It even feels great on the skin due to its use of only the highest quality materials. The winner of the title of the most comfortable mattress has to go to the Puffy Mattress. It simply is the most comfortable mattress on a list full of exceptionally comfortable mattresses. The Puffy Mattress has been crowned the best mattress of 2019 by more than one credible source and lives up to all of the claims that have been swirling around this incredibly comfortable mattress. Uniquely designed using the latest technology the Puffy Mattress provides the adaptive comfort that your body craves while remaining cool and alleviating troublesome pressure points along the spine. Motion transfer is almost non-existent, and it’s durable too. We like the Puffy Mattress because it is as affordable as it is well suited to accommodate most sleepers. 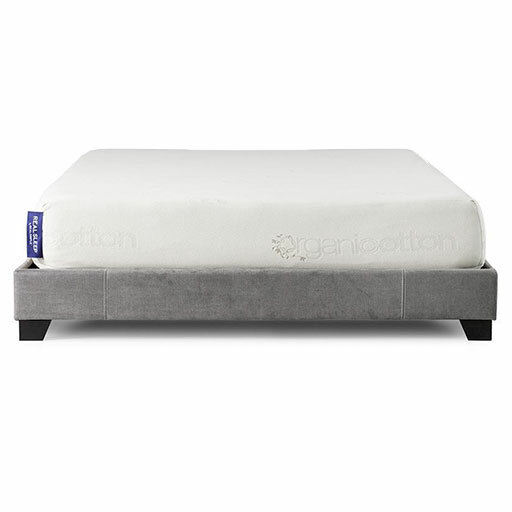 The medium firmness level is supportive yet cradles and envelops the body to provide a luxurious feel without the back pain that is often associated with memory foam. It is also highly adaptive and just as comfortable when sleeping one’s stomach as it is the side, and back. The Puffy Mattress is deserving of the praise it has been receiving and is our choice of the most comfortable mattress you can purchase for you and your partner.